The original Fresh Air Barbecue in Jackson, Georgia, is the oldest pit-cooked barbecue restaurant in Georgia still in its original location. Since its establishment in 1929 by Dr. Joel Watkins, Fresh Air Barbecue has served millions of barbecue sandwiches to the traveling public, from all over the United States. In it’s early days, “the Barbecue Place”, as it has become known, was little more than a drive-in, where people were served through the large windows in front and ate their meals on picnic tables. Following the death of Dr. Watkins in 1945, Fresh Air Barbecue was purchased by the man who had been managing the restaurant for years, Butts County native George W. “Toots” Caston, who began the process of developing Fresh Air Barbecue into a Georgia institution. Refining the cooking process to allow for indirect smoke cooking rather than direct heat cooking, enhancing and improving his father’s recipe for Brunswick stew, developing the sauce, and later, the addition of a dining room to allow for indoor eating were just a few of the many improvements made under Toots Caston’s direction. With the help of his wife Doris and a dedicated crew of employees, many of whom worked for decades in the business, Fresh Air was prosperous and, in the days before the construction of Interstate 75, was a popular stopping point for travelers going to and from Atlanta and Macon and for travelers going to Florida for vacations. Even when the interstate’s completion removed many cars from the state highway, its reputation for the best, highest quality barbecue kept people coming in, many detouring off the interstate just to stop. Fresh Air garnered both state and national attention in 1984 when Atlanta television station WSB Channel 2 conducted a statewide mail-in ballot contest to name the all time Best Barbecue in Georgia. Fresh Air and other old, established barbecue restaurants were featured each night in news segments, including interviews with the acknowledged experts in the field of barbecue that were living at the time. After several weeks of balloting, Fresh Air was named the winner and was presented the trophy on live television by members of the Channel 2 news team. This exposure attracted legions of new fans to “Barbecue Place” and today it remains a popular eating establishment on the highway to Macon just south of Jackson. 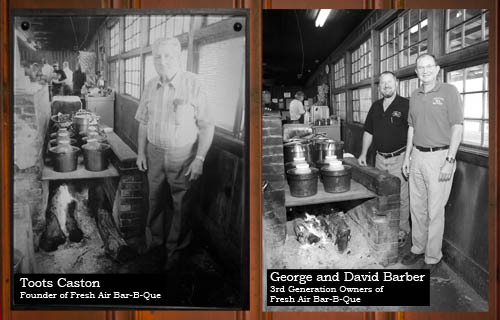 Today, four generations of Toots Caston’s family have either worked in or been directly involved with the history of Fresh Air Barbecue, adding their ideas and improvements to the business. It has been recognized many times over the years in travel magazines, through awards, and most importantly, by word of mouth. Quality goes into every product we serve. Our classic barbecue is made from pork hams, slowly smoked overnight, and served with our savory homemade barbecue sauce. Our Brunswick stew is produced in strict quantities according to recipe using stringent quality control and ingredients such as 100% eye of round roast beef, vegetables, and spices. Simplicity is a key word in our operation, and the original Fresh Air Barbecue is known for having one of the shortest menus of any restaurant around. Cole slaw is one of the few major items that have been added to it in the last 80 years, and this too is made right here. Toots continued to work in his original restaurant every day until his death in 1996 at the age of 89. His legacy, values and commitment to making the best barbecue in Georgia continue on in his children, grandchildren and great-grandchildren, all of whom are committed toward continuing his tradition of producing a top quality food product, served in an appropriate barbecue environment and at a reasonable price. To you, our customers, thank you for your continued patronage and we hope you’ll come back to see us real soon! 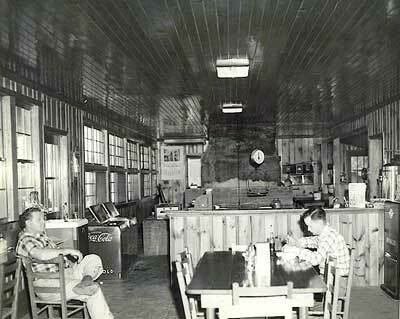 The dining room and food prep area at the Jackson location as it looked in 1956. This area has changed very little in over 50 years since this picture was made. Toots Caston takes a rare break from work (seated at left) as a customer eats lunch.